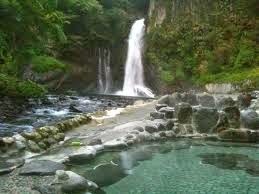 Nanataki, on the Izu Peninsular, is a small onsen (spa) town about two hours drive from Tokyo. The meaning of Nanataki is "Seven Waterfalls" and true to the name there are seven waterfalls within a reasonable walking distance of each other though a couple are stretching the definition of what a waterfall actually is somewhat. The main falls are in the centre of the town and open to the public so for first time practitioners they have the modesty saving advantage of allowing bathing suits at the outdoor pools. Be warned though, jumping into the plunge pools in the river is a bone chilling experience. Whoever said the waters are warmed by volcanic springs was applying a touch of poetic licence. The man made pools at the side of the river are a pleasure though and you can even sit the afternoon out in your own private warm water barrel if so desired. And if you are looking to start a family then there is even a special cave to receive the blessings of the spirits. Though you may want to check there's no one in there first. 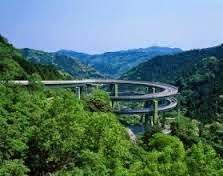 The town is situated at the bottom of a steep sided gorge and access is via a massive double spiral bridge that circles down from the skyline to the valley floor. An experience worth it in its own right. In fact Nanataki is a wonderfully picturesque weekend away for many reasons. But for me the hand sized spiders are not one of them. Though I did see one chase a waitress once….